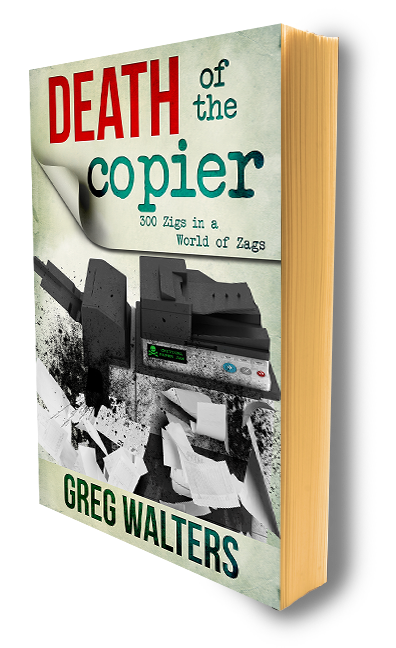 The Death of The Copier isn't about the end of you - like looms and typewriters, - DOTC is a lens into the passing of an industry; growth and expansion, not terminus. The industry is NOT dying. It is being annihilated. Annihilation: the conversion of matter into energy, especially the mutual conversion of a particle and an antiparticle into electromagnetic radiation. "...conversion of matter into energy..."
We're living in the organic process of evolution, that's all. Notice we aren't "moving through a organic process..." Because we're not moving, more specifically, Xerox, Ricoh, HP, Canon, Konica Minolta, Epson, Kyocera, and everyone else have been standing firm believing the new world will flow around them/Us. Canon has alternatives, but hasn't made the move. Ricoh seemed to be on the right path back in 2009, but took a left turn somewhere between here and MpS nirvana, which was the door to the managed services panacea. Lady Blue(HP), the most expensive dust pan in history, will sweep the fragments and splinters, toss them into some 3D printer, spitting out picnic tables. They all saw it coming, they all knew. But why believe in the revival of paper? It is the human tendency toward self-destruction. Everybody appears to be self-destructive. Some people are very obviously self-destructive because they’re addicted to heroin or alcohol or they act in a psychotic way or whatever, and they offer their self-destruction to you. Other people are very comfortable in their own skin, and they’ve got a fantastic job and a fantastic life and everything seems to be bulletproof. They feel like they’ve sort of cracked something about life. But then when you get to know them, you discover odd bits of self-destruction, which then become significant bits of self-destruction. It was the universality of it, that even the people who’d cracked it all had not cracked it all. And then I started trying to think – Where does it come from? Why is it that you have a really good marriage and you dismantle it? Why do you have a really good friendship and you dismantle it? Why do you have a really good job and you dismantle it? Whatever it happens to be. Transformation flows around the pillars of a bygone era. Some abdicate early while others define stopgap tactics as strategies - consolidating on higher ground. What once was, the dogma of xerography and toner, will never again be. The age of paper is ending - consolidation, turmoil and dwindling sales reflect the shattering of the realm. So, do you wait for the force to change you or walk in, confronting the past, present and future? Take in all the generic training you can - stay away from hardware or software specification training. Recognize value propositions, slide decks, 30 day cycles and Sales Managers as fodder for the future. Brand yourself, not your dealership or OEM.